**Bring our children to learn about our Customs & Cultural Activities. If we do not teach children, how will they learn about their Cultural Identity? Tell Family & Friends!!! These New Year celebrations have many traditional customs and ceremonies in common. On the last days of the old year everyone busily prepares sweets, moon cakes, meats, khao tom, a very large dish made of yellow beans, pork and sticky rice wrapped in banana leaves and boiled in huge boilers over an open fire. During this time, if you are downtown around Chinatown, i.e., Chau Anou Street, you can see tomatoes and other fruits and coconut being prepared as holiday treats. You will also see great streetside boilers with open wood fires burning furiously underneath them boiling the khao tom. These large, heavy food items are prepared for home consumption and presents. We tasted some in the Staff Room today. On the last day of the year, February 8, families remember their ancestors by praying for them and making offerings of a whole roasted or boiled pig, duck, chicken, or turkey, fruit and sweets. They also burn special paper money and paper clothes. People believe the deceased use the money and clothes in the afterlife and that they bring them good luck. Some people use peacock feathers to decorate small shrines in their houses. People use the shrines to pray to the gods daily and they redecorate the shrines every New Year. Many families will visit their relatives and give the children angpao, red money envelopes. It is the day to say goodbye to the old year. On the first day of the New Year, February 9, people party and visit friends. It traditionally begins with Chinese lion performances. The elders and people from around Vientiane meet at the Chinese Association in Ban Savang near the Circus at 7:00 am. A parade follows from there to the Chinese Embassy. The parade goes from the Association to Thong Khan Kham Road. Then it turns right on Khun Boulom and then left on Setthathirath. It goes straight down to Km 3 on Thadeua Road and turns left after the Australian Club in order to reach the Chinese Embassy by 8 am. If you live in the area, you will hear the drums and symbols. Those with a red invitation card hanging outside the front of their house, of any nationality, will attract the attention of the parade, which will stop and make a small ceremony offering wishes of good fortune for the future. The Chinese Association goes to every Chinese shop and house around Vientiane, and other places in Vientiane on invitation, including VIS, to dance, offer good fortune, and get contributions to the Chinese Association. It takes about four to ten days to get around to everybody. On this second day, February 10, angpao are given to the children. No one works. Shops are closed. People party. On the third day, February 11, the Chinese stay home. It is a bad day to go out, similar to Friday the 13 th . Chinese do not visit each other on this day. However, other people, Lao and other foreigners, may visit them. New Year's is a time of heavy drinking. It starts before the first day and continues for about ten days. There is a lot of drunk driving and it is a very dangerous time to be on the road, day or night. It is not just the drivers coming towards you that you must be wary of. Watch your rearview mirror for weaving vehicles. The Lao New Year begins in the fifth month of the Lao calendar based on astrological calculations. It occurs when the sun moves out of the sign of Pisces into the sign of Aries. It has been conventionally fixed on April 14. It is not until this day that the date of the year changes. This is different than in Thailand, where the year changes on January 1. This year, 2005, is 2548. Lao New Year is a national holiday and is celebrated for three days (April 14-16). However, many young people begin to celebrate 4-5 days earlier and continue for a few days afterward. On the second or third day people have a baci ceremony with or without somma. Somma is a ceremony to show respect to parents and grandparents. On a bowl, khan , or tray are placed five pairs of candles and five pairs of flowers. In addition, money or a gift, such as a sin or a new shirt is placed there. Then, with all the participants sitting on the floor, you tell the person(s) you are having somma. You say, "I am here to have somma. Here are some flowers and candles and a gift for you. Please forgive me for anything I may have done wrong to offend you that I don't know about." The person receiving somma says, for example, "bo pen njang". Don't worry about anything in the past. It's forgotten. Let's look to the future. I wish all good things for you in the coming year." Another important tradition at this time is to take your Buddha image down from its "altar" and bathing it with fragrant water. Fragrant water is prepared by adding perfume and flowers to clean water. The image(s) can stay down until the end of Lao New Year, in which case visitors to your home can also pour water on it, or it can be returned immediately to its place with new candles and fresh white flowers. People also give each other blessings of good luck and good health by pouring a little clean water from a bowl on the back of their friend's neck. Afterwards the friends nop each other. Unfortunately, in Vientiane this practice has become corrupted into the free-for-all throwing of dirty water and/or water with dye in it. People will drive around with large containers of water and heave bucketful's at anybody they drive by, pedestrians and people riding bicycles, motorbikes or Tuk-tuks. Sometimes balloons of water or plastic bags of water with ice are also thrown. As you can imagine, this is scary and dangerous. Every year, there are many traffic fatalities due to this behavior. Nobody likes this behavior and every year people ask the government to provide greater control of this dangerous practice. The Boun Pravet festival is concerned with re-telling the story of the penultimate life of the Buddha, for Thais the favourite and best known of the Jataka stories. It is the Mahachad, ‘the great story’. It tells of Prince Vessandorn (Pravet), son of King Sri Sanjaya, who gave away his white rain-producing elephant to a nearby kingdom which was experiencing drought. He was driven out of his home city with his beloved wife and two children. He never hesitated in giving away anything that was asked of him and even parted with his children and his wife when they were requested. In the end, his wife and children were restored to him as reward for his generosity and the people of his city went to the forest to beg him to return to rule them. As a result of his unfailing generosity and his complete lack of ‘clinging’ he was reborn into his final incarnation. Khao Phansaa , marks the beginning of "Buddhist Lent." According to legend, there was once a group of six monks walking about during the rainy season. They were careless about where they put their feet, stepping on frogs and crushing new rice plants. This angered the farmers who complained to the Buddha. The Buddha made the rule for the sangha, the community of monks, to observe Khao Phansaa , which means "entering the rainy season." The rule is that for three months during the rainy season the monks must vow not to stay overnight away from their temple, unless they have permission for special circumstances such as visiting sick parents, going to deliver sermons. In any case, they can never be gone more than seven days. On the full-moon day of the eighth lunar month people go to the temple with incense sticks, candles, and pha ab nam fon (a yellow robe for bathing) and offer them to the Buddha statue in the temple. After that, they perform the prayer/chanting ceremony, vow to follow the precepts (five rules of conduct), and listen to a sermon. On the first day of the waning moon, lay people tak baat (give offerings) , take the precepts, and listen to a sermon. After the evening prayers, the novices and monks make their vows to stay in their wat and kuti , residence, for the three rainy months. At night about eight o'clock, hundreds of people go to the banks of the nearest river to set their boats adrift. First, a candle is placed in the center of the boat and lit. Then as the boat is placed in the water, wishes are made that all bad luck will go away and good luck will come in the future. In Laos, the custom is called "Lai Heua Fai" (Drifting Boats of Fire). The little boats are usually made from banana leaves and decorated with flowers. Boats can also be made from bamboo or other natural products. In Thailand and for a year or two in Laos people used Styrofoam boats, but the government banned them. Boun Sooung Heua , The Boat Racing Festival, comes in September or October, toward the end of the rainy season. The first of the races run on the Mekong River is at Luang Prabang, the former royal capital now a World Heritage Site. Then in the following weeks, other races are held at various places downstream. A wat or other organization sponsors each boat. Rivalry is intense. High spirits are even more intense. Crews of young men walking to their boats with their paddles over their shoulders sing chants. One of the more gifted boatmen leads the chants, improvising as he goes along. The others enthusiastically pick up the words and repeat after him. Verses of the chant would be considered ribald by many Westerners, but are inoffensive to most Lao people. The chants have their best audience when the racers sit idly in their boats before the race begins, holding their paddles upright or perhaps they stand up and dance as they sing, while they are towed upriver to the starting line by "long-tailed" motor boats, so called because of the long propeller shafts. The crowd on the bank hears the chants and enjoys the show. There are also women's teams and foreigners are invited to join. The end of Buddhist Lent is held on the 15 th day of the waxing moon. Many important ceremonies mark this day. 3. Vien Thien - Before 8pm people gather in the temple for a prayer and, led by the monks and novices, circumambulate the sim in a clockwise direction three times holding flowers, candles and incense sticks. When this is finished, everyone illuminates the heua khok , a bamboo model of a racing boat built on the ground ( khok ). Lit candles are placed everywhere in the temple grounds, on stupas, and along the fences. Private homes are illuminated in the same way in homage to Buddha. 4. Lai Heua Fai - Small boats decorated with flowers, lit candles and offerings are launched onto the Mekong River. Disease, shortcomings and bad luck are said to float away with them and wishes are made for the future. Along FaNgoum Street, it is very crowded and you might not be able to get down to the river. For a small fee, a young lad will be happy to put your boat in the water for you. The boats should be organic, not Styrofoam or plastic. Watch out for firecrackers! This is an ancient tradition, lovely to see and participate in. Boun Kathin occurs anytime from the day after Boun Okk Phansaa , i.e., the first day of the waning moon of the eleventh month, to Boun That Luang, i.e., the fifteenth day of the waxing moon of the twelfth month. Boun Kathin is the highest form of making merit for lay people. It serves to maintain the well being of the monks and the temple by providing the necessities of every day temple life. You can recognize a kathin procession by the Buddhist flags of red, orange, yellow, white and blue stripes decorating the pickup truck or otherwise displayed. There is usually a tree made of bamboo to which strings of kip are attached. It is a joyful time. People play drums, gongs, and other musical instruments as the procession moves along the road. There is singing and dancing to the beat of the music. You may be stopped on your motorbike and be asked to make a small contribution. You may join the procession if you like. For one or two weeks before Boun That Luang (the 15 th day of the waxing moon of the 12 th month), talat nut is held in the open areas around That Luang. At this fair, provinces, ministries, foreign embassies, and many businesses take the opportunity to display information about themselves and sell their products. If you wish to vien thien around That Luang be sure to wear a sin or skirt. It is also possible to rent one there for five thousand kip. Thursday, 25 Nov. Vien thien of phasad pheng at Wat Si Muang. The circumambulating begins as early as 4:30, but the best time to go is after dark when the light from the candles is so beautiful. A phasad pheng is a castle of bees' wax in which reside good spirits, feelings and thoughts. Friday, 26 Nov. Procession of phasad pheng and parade of different groups in costume. 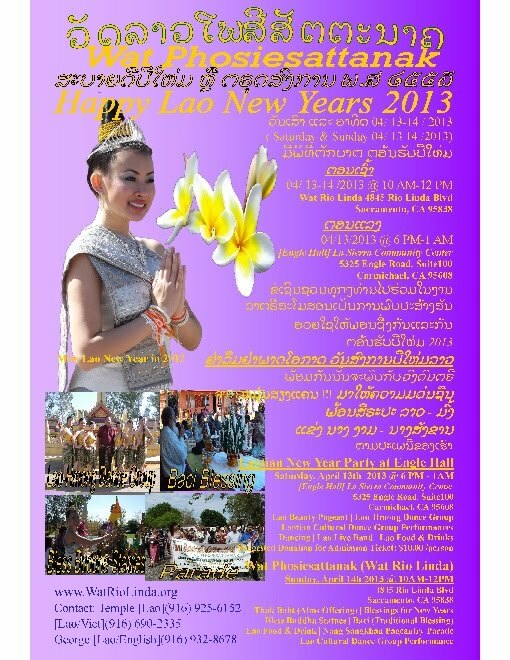 The parade begins about 1:30 at patuxai (the monument) and goes to That Luang. It is a great photo opportunity. A good place to wait is at Wat Nong Bone, the temple at the top of the hill beyond the traffic lights on the right. It takes about thirty minutes for the parade to reach the intersection. Saturday, 27 Nov. Tak baat at That Luang. People arrive before 5:30 a.m. when it is still dark to get a place on the ground. Women dress in their finery and men wear a pha bieng , too. Again, this is a wonderful photo opportunity. A thousand monks border the area with their bowls on a table before them, and the crowd, seated on mats or newspaper in a multitude of colors, fill every inch of ground. The official closing ceremonies for the fair are in the afternoon and the traditional Lao game of tiki is played between the townspeople and the government officials. Watch the full moon come up behind That Luang. At night around 7:30 are fireworks. Sunday, 28 Nov. During the day, the phasad pheng go in a procession to Wat Inpheng and Wat Ongtu. In the evening, a celebration is held with more phasad pheng and vien thien at the temples.